Every six months, we conduct a survey of IT professionals in both Christchurch and Auckland for our Sourced Report, asking a range of questions around their roles and the sector at large. 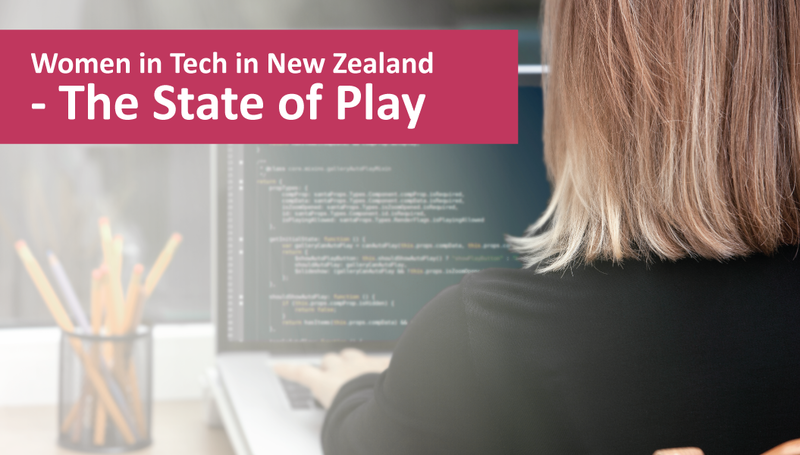 With International Women’s Day last week, we thought it was a great time examine the state of play when it comes to women in the Tech industry in New Zealand, so we split the data we’d collected by men and women and compared the results. This produced a number of interesting findings, and showed that while great progress is being made, there is still some way to go before true parity is reached. In what may come as a surprise to some, when looking for an IT role, women and men both look for the same three key things: challenges, work/life balance, and career opportunities. These are the three pillars that IT professionals find important in a role no matter what gender they are, although there is some discrepancy between men and women in Auckland. Men in Auckland tend to value career opportunities (74.24%) above challenges (68.18%) and work/life balance (65.15%), whereas women put work/life balance first (77.43%), with career opportunities (62.44%) and challenges (50.71%) in second and third respectively. In Christchurch, results are virtually identical – with work/life balance coming in ahead of challenges and career opportunities. These priorities are reflected in what women find important when it comes to culture. Flexibility again ranks highly (#2 in Christchurch, #1 in Auckland), as do support from management/leadership teams (#1 in Christchurch, #2 in Auckland) and professional development (#3 in both areas). The overarching story here is that there’s little difference between what men and women actually want out of their work, and yet, when we look at benefits, we can see a fairly significant difference in what they end up getting. In Christchurch, the types of benefits and the level to which they’re received is fairly comparable. In Auckland however, this isn’t the case, with a third of women respondents stating that they do not receive any of the benefits listed, as opposed to just 20% of men – despite both men and women essentially wanting the same things. Yet, across the board the percentage of women receiving each benefit was less than the percentage of men. In some cases, there was a fairly dramatic difference. For example, just 16.81% of women stated they received professional development as a benefit, as opposed to 34.85% of men – less than half. This brings us onto the key issue often discussed when it comes to gender differences in the workplace: salary. While unhappiness with salary is a trend across the whole dataset, in Christchurch we can see a clear disparity in the percentage of men who are happy with their salary. 44.12% of women said that their salary was lower than their expectation, as opposed to 38.13% of men. It’s not as if salary is less important to women in either. When we asked our respondents to rank the importance of salary on a scale of one (very important) to five (not important at all), women actually came in as slightly more salary driven than men (a 2.31 average versus a 2.54 average for men). Comments reflected this, with many emphasising the importance of being paid fairly for their skills. I am presently looking for a new job because my employer would not meet the market rate when I specifically outlined this and demonstrated exceptional performance. [Salary is] very important, as it is the reward of the hard work and needs to match the responsibilities under the current role. A very good and fair salary allows you to have a good standard of living and plan for the future. In Auckland the issue was less pronounced. Less women than men stated that their salary was lower than expectation (41.67% vs 47.69%) however, not one woman in Auckland stated that their salary exceeds their expectation. Once again, there was little difference in how important salary was between men and women, with men scoring 2.24 and women scoring 2.25, and comments around the importance of salary made this even clearer. Within IT there are always changes and unknowns. As I need to be on standby or work overtime, unplanned time away from family must be compensated for with a fair and good salary. Above the average market salary. Salary is very important. When issues arise in the workplace it is nice to know you are being paid well. Unique difficulties faced by women didn’t just exist in relation to salary either. When asked to rate how easy or difficult it was to progress a career in IT in either Christchurch or Auckland, a greater percentage of women than men stated that it was more difficult. In Christchurch, 14.29% of women stated it was extremely hard, compared to 7.91% of men. In Auckland, this number sat at 34.23% of women, as opposed to 19.70% of men. In both cases, we can see a very significant difference. While the above might make for some alarming reading, it’s important to remember that progress is being made. More women than ever are moving into the IT industry, with organisations recognising the strong link between diversity and success, and we’re also seeing progress with the gender pay-gap and opportunities for women in the Technology sector. However, while big-picture progress is good, it’s important to remember that we’re still not there yet. There are still inequalities to be overcome, and it’s only by remaining focused on those and working together that we’ll be able to build an industry where everyone has the opportunity to succeed.